Strip waxing (soft wax) is accomplished by spreading the wax thinly over the skin. A cloth or paper strip is applied and pressed firmly, adhering the strip to the wax and the wax to the skin. The strip is then quickly ripped against the direction of hair growth, as parallel as possible to the skin. This removes the wax along with the hair. Strip-less wax (as opposed to strip wax), also referred to as hard wax, is applied somewhat thickly and with no cloth or paper strips. The wax then hardens when it cools, thus allowing the easy removal by a therapist without the aid of cloths. This waxing method is very beneficial to people who have sensitive skin. Strip-less wax does not adhere to the skin as much as strip wax does, thus making it a good option for sensitive skin as finer hairs are more easily removed because the hard wax encapsulates the hair as it hardens. The strip-less waxing method can also be less painful. 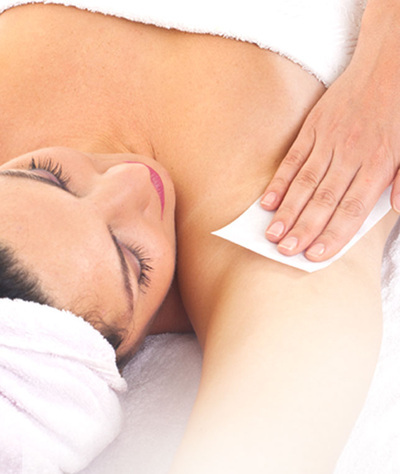 Waxing on sensitive body parts is best performed by an expert such as a licensed esthetician. There are many benefits to waxing versus other forms of hair removal. It is an effective method to remove large amounts of hair at one time and it is also a long-lasting method of hair removal. Hairs in waxed areas will not grow back for four to six weeks. When hair is shaved or removed by depilatory cream, the hair is removed at the surface rather than the root. Within a few days, the hair can be seen at the surface. With these methods, hair tends to grow back in a rough stubble. Areas that are repeatedly waxed over long periods of time often exhibit regrowth that is softer. Copyright © 2014, Pinky Threading Salon, All Rights Reserved.